There’s no place in your establishment where air care and fragrance selection are more important than in your facility’s restrooms. Your restrooms are the number one communicator for the cleanliness of your operation as a whole. If a customer, patient or patron becomes grossed out by the state or smell of your restroom, they’re going to question even more what’s going on behind the scenes. Particularly in the areas of your facility they don’t have access to. In food service, this is a red flag for how clean you may be keeping your kitchen. In healthcare patients going to wonder how safe they are being treated in your facility. The list goes on and on. One thing’s for sure: If you keep restrooms smelling fresh, more people will perceive your facility as clean. Luckily, at Johnston we have air care solutions to meet a variety of needs. It’s important to tackle odor elimination and prevention in restrooms on multiple fronts. The products below are some of our favorites to help you keep restrooms smelling fresh. Preventing the spread of odors throughout the restroom is half the battle. Our friends at Fresh Products and Georgia Pacific have developed some great products to fulfill this need. 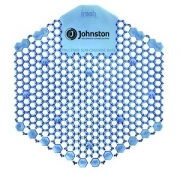 These 30 day urinal screens dual sided splash control technology which eliminates 99% of splash back on both sides. The design helps prevent incorrect installation as well and has easy replacement reminder tabs built right in. Best of all the Wave 3D screens contain beneficial bacteria that consume odors, rather than just masking them –keeping your drains clear, clean and smelling fresh as well. This bowl clip contains 30 times more fragrance than the standard rim stick and releases a consistent fragrance load over 3 days. 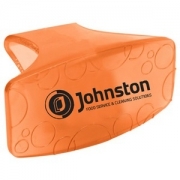 The discrete and secure design allows it to be clipped to the side of the toilet tank, bowl or the plumbing lines. These great innovations from Fresh Products come in a variety of scents. The top 5 available through Johnston are Honey Suckle, Mango, Cotton Blossom, Citrus and Spiced Apple. The ActiveAire line of automatic in-stall odor neutralizers utilizes motion sensing technology to release a burst of freshness upon entering and leaving the stall. Two models of dispensers are available. One that mounts directly inside the stall and another that mounts specifically to the top of the Compact side-by-side bath tissue dispenser. The 4 most popular scents available through Johnston are Coastal Breeze, Pacific Meadow, Citrus and Breezy Linen. 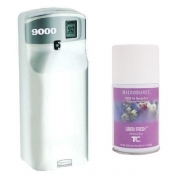 It’s important to have automated air freshening solutions for the entire restroom as well. The products below focus on tackling this task daily without you having to worry about it. This system provides consistent freshness for 30 days. The cover that slips gently onto the dispenser is the air freshener itself. Each cover contains a new battery so you never run out of energy. 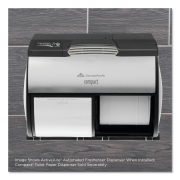 The Easy fresh dispenser is programmed to that as the 30 days pass and the fragrance evaporates, the fan spins more frequently keeping the room smelling just right. Microburst dispensers can be specifically programmed for 12/24 hour per day operation and 5, 6 or 7 day per week operation cycles. There is a visual battery gauge as well as a “Days To Refill” indicator. Its smart chip technology maximizes odor control effectiveness for 30 – 180 days depending on model and frequency. The main difference between models is in the name. The 300 models have refills that hold 3,000 sprays while the 9000 models are 3 times larger and thus hold triple the amount of sprays. The Microburst line comes with a variety of fragrances and even offer variety packs for refills to avoid fragrance fatigue. 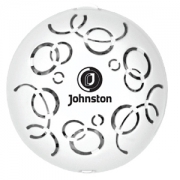 Johnston’s experts can assess your specific odor prevention needs at your facility and recommend the ideal product combinations to keep your restrooms fresh. Our team has seen it all when it comes to restroom sanitation and can work collaboratively with you to develop a custom solution that meets your budget, and solves your odor woes.